Carers come in all shapes, sizes & ages. Are you a carer? Take Our Quiz to find out. Discover what Government supports and services are available for carers in one handy booklet. Recently updated! Can’t find what you need? The National Carer Resource Centre can help! If you have a problem or concern, please let us know. Download our full infopack with one click! Can’t find a relief carer to use your Carer Support Subsidy or other respite funding? Carers NZ works closely with Mycare, the online place where it’s easy for people seeking or offering relief care to connect with each other. We are currently trialling sharing of relief carers in parts of New Zealand – we can put you in touch with other families who’d like to work together to organise relief care. Call 0800 777 797 or email, centre@carers.net.nz To learn more about Mycare visit the website or call its service team on 0800 677 700! Carewise is a new initiative with a new website coming to the web soon. Look out for it! Sapere has completed its paper outlining issues and options relating to paid family care in New Zealand. Want an issue of our magazine? Sign Up for Our E News! Receive our regular roundup of news, articles and events straight to your inbox. Get the articles and news you want emailed to you as soon as they are published. 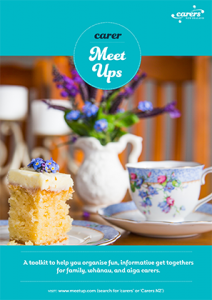 Would you like to meet other carers in your community or host your own MeetUp? It’s easy with our toolkit. Supporting someone else may be so much a part of what you do each day that you don’t see yourself as a family carer. That’s fine. We’re not about labels. But we are about making sure that anyone who assists a friend of family member who has extra needs due to illness, old age, or disabilities has access to support and information. Do you assist someone living with you who has health, disability, or age-related support needs? Do you worry about leaving that person home alone? Do you listen and try to help if someone at home is feeling down or depressed? Do your responsibilities at home mean you often miss out on doing other things you enjoy, or would like to do? Have you given up work or reduced your hours so you can give more support to someone at home? Do you regularly visit a friend or family member who doesn’t live with you to provide companionship or help them with everyday tasks? Do you regularly arrange hospital and other appointments, provide transport, or help someone manage their affairs so they can maintain their independence? You can definitely consider yourself a family carer. You’ll find so much on our website to help make your caring journey easier. You may not fit the definition of ‘family carer’ but chances are there is someone close to you who does. You’ll find resources and information on our website to help you support them in their caring role. Guide for Carers – sources of assistance for carers from government agencies. Time Out – a guide to respite and making sure you get the breaks you need. MeetUps – ways to get in touch with other carers and find support and information. And lots more to support your caring situation. You can also subscribe to Family Care magazine – our publication, packed with inspiring stories and advice. 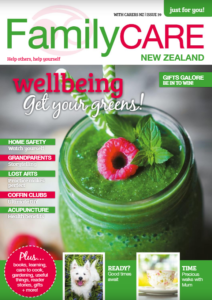 Get a free Carers NZ info pack containing the Guide for Carers, the latest Family Care, and other resources. Send a request here, or phone the National Carer Resource Centre helpline during business hours, (0800) 777 797. You can also phone the helpline if you need individual support, advice, or referrals to other sources of help for family carers!